I was going to start a new job in a few months and I just got a new laptop. I was in the market to get a fashionable and sleek messenger bag that I could wear with business casual attire. I planned to only carry my laptop and maybe a notebook. Most of the bags I saw were either too bulky for my tastes or too casually designed to fit in a professional environment. 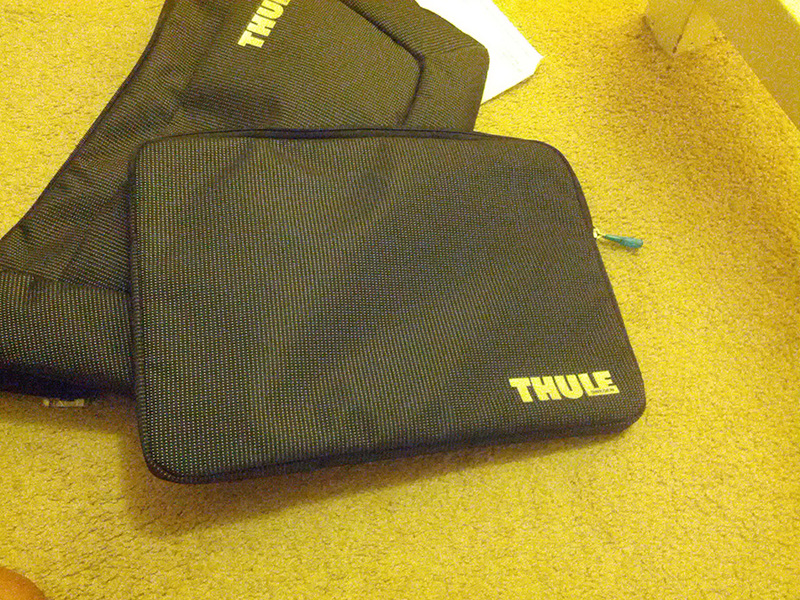 Thats when I came across the Thule Crossover 15L Messenger Bag. Thule is a brand that manufactures various types of transportation solutions for the active crowd. The Thule product line includes everything from ski boxes, bike racks, roof racks, snow chains, boat and horse trailers, to laptop and camera bags and backpacks. They take durability and quality very seriously and it is evident in the Crossover. The Crossover is made with water resistant, coated nylon. A gripe that I have with bags usually is that, the stitches start wearing out visibly – but that is something that the Crossover didn’t exhibit even after months of using. I was actually expecting the part where the belt attaches to the body to get worn out since thats where the weight is concentrated but it still looks like new with so signs of wear. There are two main compartments in the bag. The main laptop one and a front accessories one. Here’s the amazing part, the bag comes with a laptop sleeve included! Same water resistant coated nylon construction with padding inside. One interesting thing I noticed is that the laptop compartment opening is not actually the same width as the sleeve. You have to slide one end in first and let it drop in. Was a tad bit confusing at first but got used to it. 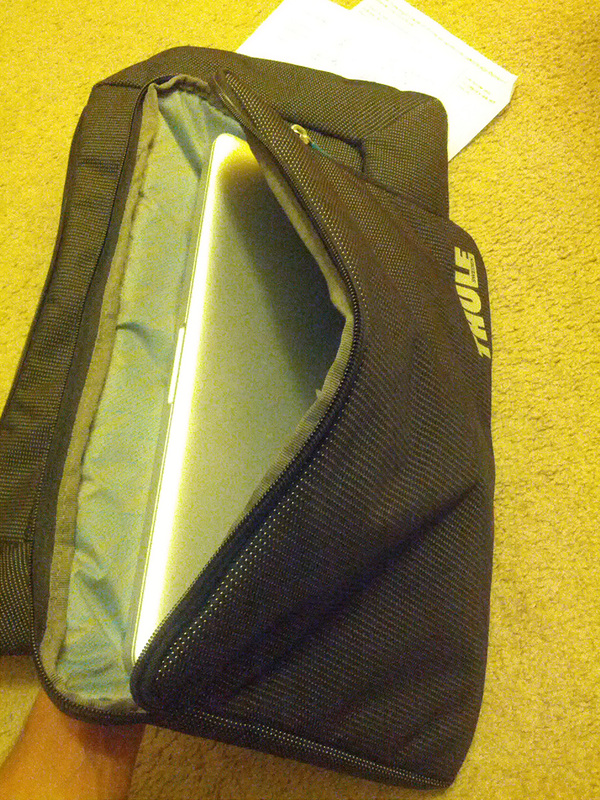 The laptop compartment also has two large pockets – I use them to keep my charger and mouse. 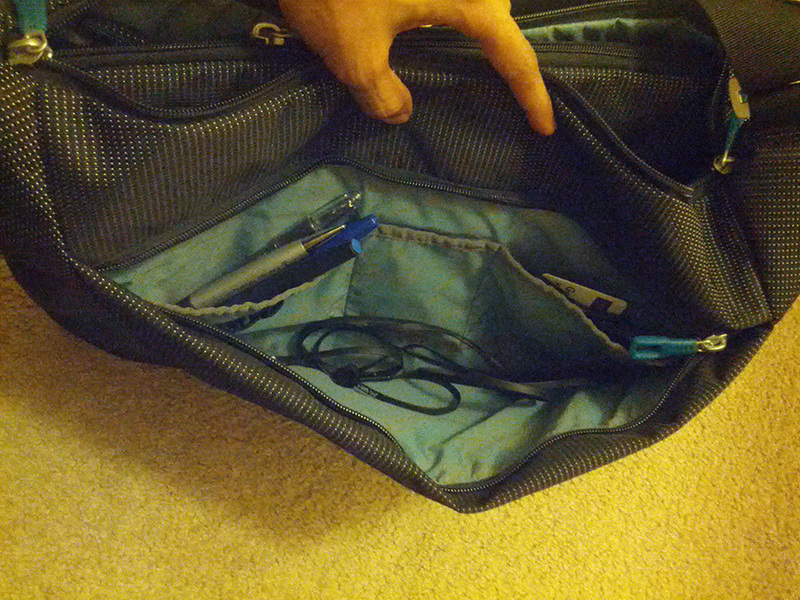 The accessories compartment has three pockets to organize more items with one of them having three pen holders. Pretty basic. One thing to note now is that this bag is minimalistic. Unlike others its not overflowing with pockets and compartments here and there. It works for me – being focused on just carrying the essentials. Keeps the bag slim. The strap unfortunately does not have extra padding to sit on your shoulder. I was worried about it first but after using it – realized that the weight is distributed really well. Carrying my laptop, charger and mouse – it wasn’t a sore for me. The strap has large aluminium tabs to manage the length. I like that they opted for aluminum rather than cheap looking plastic. The zippers too are of the same quality and they are covered by a transparent blue plastic cover through which you can see the THULE logo. Its cool really. The only other branding on the top is just in front where it once again says THULE and then Sweden in the E. Large branding logos are usually annoying on a bag but the THULE logo blends in really well with the black background and white dots. The Crossover I believe is now a discontinued model which is a real shame. The current generation messenger is a standard messenger bag with more space and pockets. Its doesn’t have the same slickness as the Crossover. Neither does other brands actually. This was the only bag that fit the slim casual category. If you are looking for something similar I suggest you snag one up before stock runs out! There are online retailers that are still selling them.